Starting from scratch: The reflective approach. You are here:Home Online Business Ideas Starting from scratch: The reflective approach. What sites do you build? Do you just build lots and see what sticks? Personally I took a different approach when choosing my first genre, many years ago I subscribed to Wordtracker who offer a free email service whereby they email me the top searched terms, I still get this today. This would be more a reflective approach to look at what is already out there and what is already profitable and then to try and jump on the bandwagon by looking to obtain a piece of the action. These are the top 300 queries from the last 48 hours, which represents the complete queries from the largest Metacrawlers on the web (Metacrawler/Dogpile etc..) for the last 48 hours. 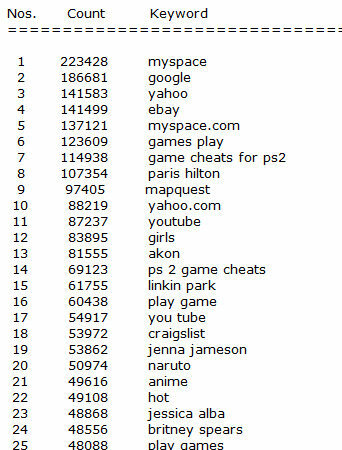 Our current database contains 372,689,837 search terms and represents the complete queries from the largest metacrawlers on the web (Metacrawler/Dogpile etc.) for the last 90 days. This gives you a good indication of current and more longer term popular searches which I used to choose my very first topics/niche to develop in. If it’s in the list it is popular, therefore it is searched for and then aiming for a small piece of this traffic seemed like a good starting point. Looking for something popular today & popular over the last 90 days – no point building a site around something that is here today and gone tomorrow so when making a shortlist I looked for longevity. Appearing in both lists is therefore a bonus and using my own knowledge & research to work out whether I’d expect it to be around & still popular in 1,2,3 or 5 years time. I decided to avoid names, bands & celebrities as they would always have some sort of shelf life and also leave you liable to trying to profit from other trademarks & copyright problems. So recent in lists you’ll find ‘Transformers’ but personally I’d skip that as by the time your up and running and ranking the party will long have finished. Should lend itself to a variety of ideas, so something that could offer a variety of website ideas, I’d ask myself could I build an info site, product site, subscription site, social/dating/forum site, mini site – if you can find a topic that is large enough to give you the scope to think of a variety of ideas it helps you develop into the niche and cover it well in various forms some of which are easier to get linked to than others. For example a free information site could get well linked to which you can then use to pass traffic and authority to your more product based sites. Looking back, anything that is product based would likely offer you a higher return for easy advertising models like Adsense, however non product based topics can also be monetised very well through clubs, forums, memberships and related products so basically what I am saying is don’t always chase the big keywords, the smart developer can make a profit from any topic and sometimes its less competitive and more lucrative to go in a different direction. I wouldn’t get hung up on the Wordtracker list sources, at the end of the day I used the free keyword report as inspiration, it should be accurate enough to give you ideas and suggestions if your blank and not an ideas person, once you have a topic you can then start thinking outside of the box in ways to add value to what is out there, to carve your own piece of cyber space. You also don’t need to be an authority in any of these keywords, it’s a big world out there and you can use forums & resources out there to find people who are passionate about the topics that you choose, you can then source & pay knowledgeable people if you need articles or info related text on a subject. That is how I started and I still get the report and check it out today for new ideas and inspiration. To an extent James, however Xmas is probably about getting in ahead of the game so you may want to do some research on what will be popular rather than what is popular to make a killing. I recently created a tool that creates a report using information from multiple keyword suggestion sites/tools and finds the top Google sites with pagerank for a given keyword. Several people have used my service, if interested in receiving a report, send me an email. Another link here, but a good one. A useful article on where to get inspiration for keywords. Finally a good use for junk mail! Nice link, I have been wanting this kind of information. Nice touch with picking a more durable term. I am trying to think of a way to ‘ride the highs’ and make use of the shelf life terms. More tricky but possibly more fun also.